Marketing Information: Scale your Power over Ethernet connection by 100m, or daisy chain up to four extenders for longer distance. This Gigabit PoE+ extender spans your Power over Ethernet (PoE) device over longer distances, letting you double the 100m limitations of a traditional PoE infrastructure. 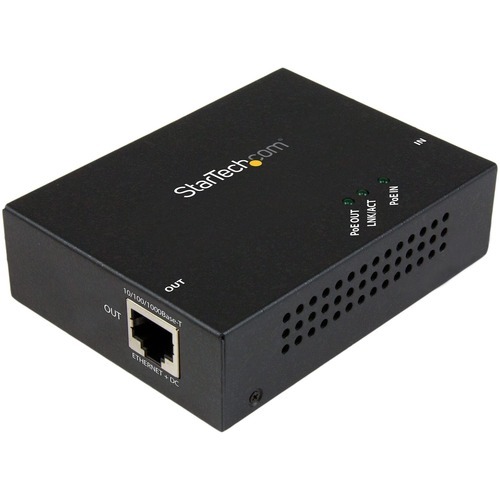 Now you can connect your Gigabit PoE device up to a maximum of 200m away, so it's easy to install a remote IP camera or access point. Plus the extender can be daisy-chained for more scalability. Need more distance? This convenient PoE+ repeater maximizes range and flexibility by extending your PoE connection by an extra 100m (330ft), while providing 24-watt power output to compatible devices. Simply connect the extender to your power sourcing equipment (PSE) and your PoE-powered device (PD) and you're all set. The extender is compliant with the 802.3at/af standard, so it will work with existing PSE, such as a StarTech.com POEINJ1G" text="PoE+ injector (POEINJ1G) or IES81000POE" text="PoE+ switch (IES81000POE). Still need more distance? If an extra 100m isn't enough, this full-featured PoE extender offers daisy chain capability. You can easily connect four extenders together, letting you install your PoE+ PD up to 500m (1640ft) away. It's perfect for business, education, and retail environments (output wattage is dependent on the number of daisy-chained extenders used). Get up and running quickly. This Gigabit PoE+ extender can be positioned right where you need it, with a wall-mountable design that requires no external power adapter. You can enjoy reliable performance with little worry of downtime or failure, the extender features a rugged metal housing with built-in ESD and surge protection. The POEEXT1GAT is backed by a StarTech.com 2-year warranty and free lifetime technical support.